Over the last 20 years, the Guy Harvey brand has caught on with anglers, outdoors enthusiasts, and even art fans--just to name a few. The brand has grown from humble beginnings into a truly international enterprise. Today, the Guy Harvey name has expanded far beyond its original line of leisure clothing, encompassing hotel resorts, restaurants, sporting accessories, and much more. His artwork has also been commissioned for floor-to-ceiling wall murals, like the one he painted for the Ft. Lauderdale Airport. With such a wide range of officially licensed products, it only makes sense that Guy’s beloved artwork should also be featured on silver bullion products. Whether you prefer standard bullion rounds or limited edition collectibles, you can now own Guy’s majestic sea life designs in stunning .999 fine silver with the Gainesville Coins exclusive line of Guy Harvey products known as the Guy Harvey Collection! A portion of each product sold is donated to The Guy Harvey Ocean Foundation. A portion of every Guy Harvey product sold is donated toThe Guy Harvey Ocean Foundation. Guy Harvey is a critically acclaimed artist (both painter and underwater cinematographer) and a highly successful entrepreneur, yet he is first and foremost an accomplished marine scientist. After earning his degree in Marine Biology from Aberdeen University (Scotland), he returned to the Caribbean and received a Ph.D. in Fisheries Management while studying at the University of the West Indies. In addition to painting ocean life, Guy continues to spearhead marine conservation efforts through his Guy Harvey Ocean Foundation, the Guy Harvey Research Institute at Nova Southeastern University (Florida), and his documentary films chronicling various patterns of underwater life. A skilled diver, Guy is also the innovator of techniques for observing free swimming billfish in their natural environment. Most recently, the 1,065-foot cruise liner Norwegian Escape, which is set to debut in October 2015, will bear a full-size mural covering the hull designed by Guy himself. He also has one of the most distinctive (and thus recognizable) signatures in the celebrity sphere. 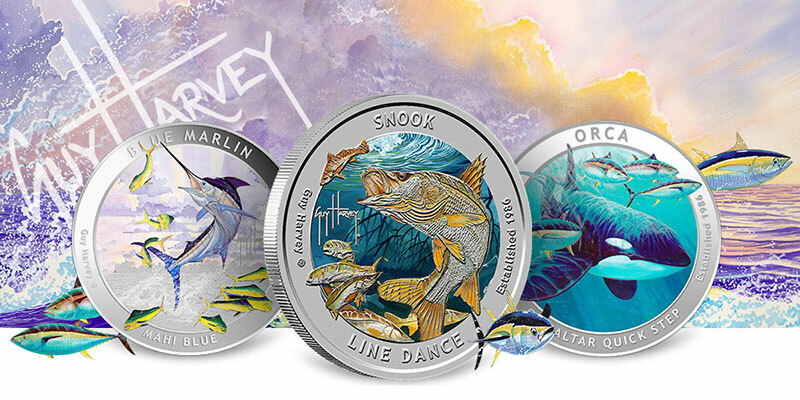 The fantastic popularity of the Guy Harvey brand now brings its famous artwork to hobby of collectible silver rounds through an exclusive partnership with Gainesville Coins! The Blue Marlin is feature in the first series of the Guy Harvey Collection, introducing Series 1 to the world in style. The design artwork for Series 1 is officially license from Guy Harvey's original "Blue Mahi" print, showing a Blue Marlin majestically emerging from the water's surface along with a group of Yellowtail Amberjack. For a low-cost option, you can purchase this design in a copper version. For the silver rounds, three varieties are available: a standard Brilliant Uncirculated finish, a stunning proof finish, and even a colorized proof finish. The second series in the Guy Harvey Collection of silver bullion focuses on the Snook, a fish that so many of us are familiar with. 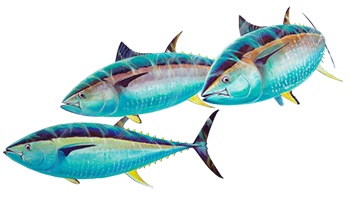 The artwork used for this design originally appeared on Guy Harvey's work, "Line Dance." It depicts a Snook angling to the left, mouth agape, with other Snook and Amberjack in the background. You have several different options to choose from with Series 2. The design comes in three different finishes on 1-ounce silver rounds: proof, colorized proof, and Brilliant Uncirculated. You can even collect all three! The third installation in the Guy Harvey Collection depicts the biggest sea creature thus far in the series, the humongous Orca whale. Just as they appear in Guy Harvey's work known as "Gibraltar Quick Step," the Orca is flanked by a school of Bluefin Tuna. The Guy Harvey Series 3 Orca design is offered in variety of bullion and collectible versions. You can choose from the Brilliant Uncirculated finish, proof finish, and colorized proof finish for silver rounds, as well as a .999 fine copper round. Take your pick, or collect every option in Series 3! Guy’s early masterpiece, “Santiago’s Finest Hour,” is a work of art best fitted to a traditional portrait layout rather than a round one, so this captivating image has instead been imparted onto larger 10 oz silver bars. This not only lends itself to showing the full scene of the painting, but also allows for greater breadth of detail than a smaller 1 oz round. Each bar is .999 fine silver and has an actual silver weight (ASW) of 10 troy ounces. These 10-ounce silver bars are primarily valued for their fine metal content, but the incredible depth of their original Guy Harvey artwork makes them worth showing off or displaying for company. Who said stacking silver had to be boring?